Well..as the title states..this post is long overdue. I love blogging, I love following other bloggers and I love my followers. Unfortunately, all of this blogging love doesn’t pay the bills or help my daughter learn Oh Captain, My Captain any quicker. Between work, the Holidays, family and Thoreau, I’ve been pulled away from my sweet little niche I’ve carved out in this wide and wonderful internet world. 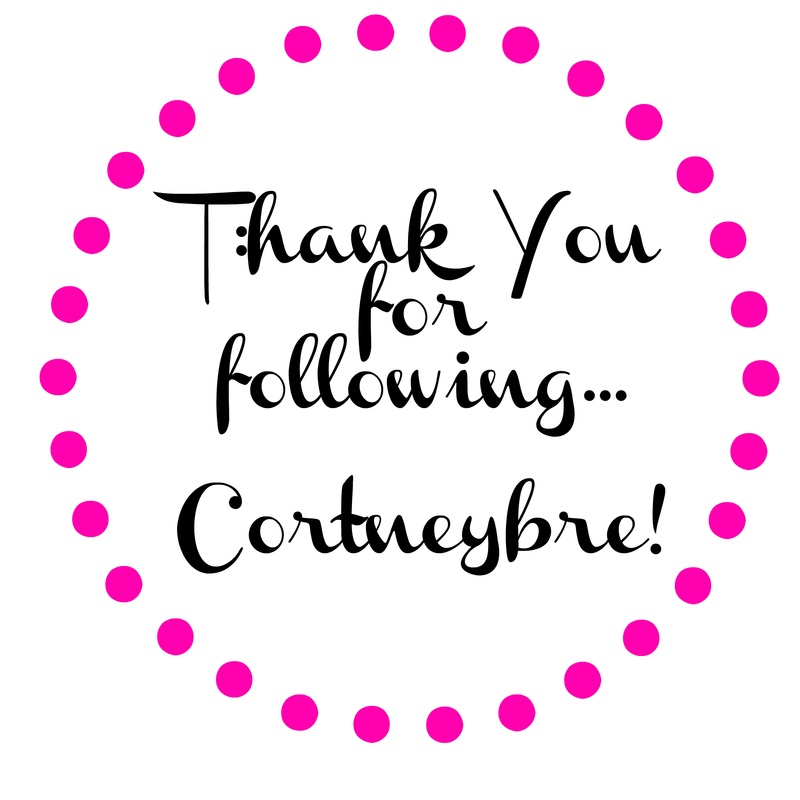 For those of you whom I usually follow, please know I’ve missed you all and I promise I’ll be back soon ..marveling at your talents and commenting on your fabulous posts. For those of you who follow me and wonder what quirky and crazy outfit I’ll come up with next, please be patient and know that I’ll be back working it soon…this crazy life of mine has to calm down! That all leads to today’s post. This outfit just get’s me and I love it! 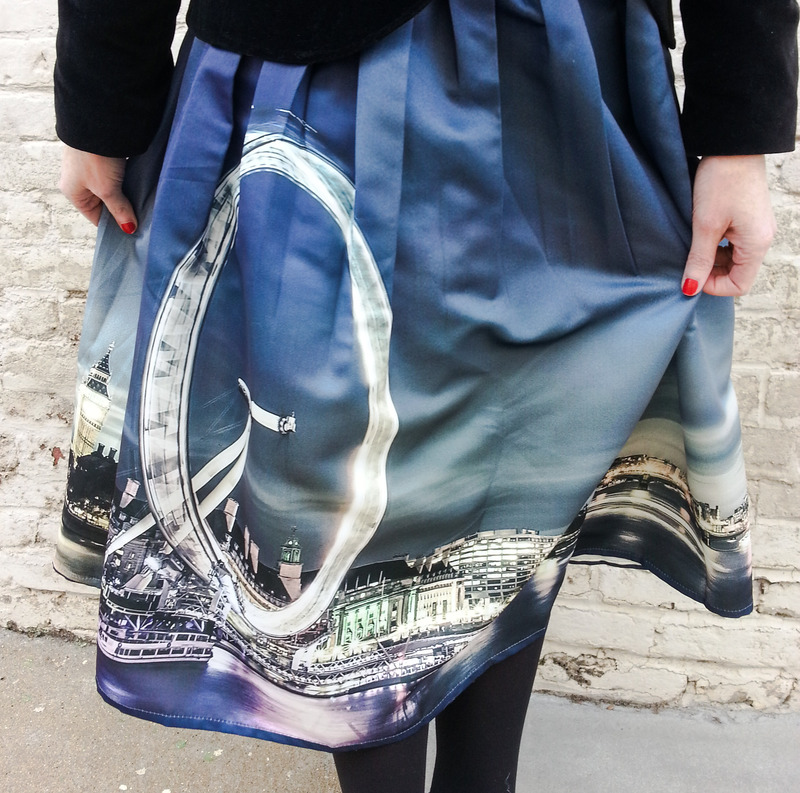 As in my last post, this skirt takes me away on a little journey and this time it’s to London…the skyline winking out at you as I walk by. I can’t tell you how much I love this skirt. 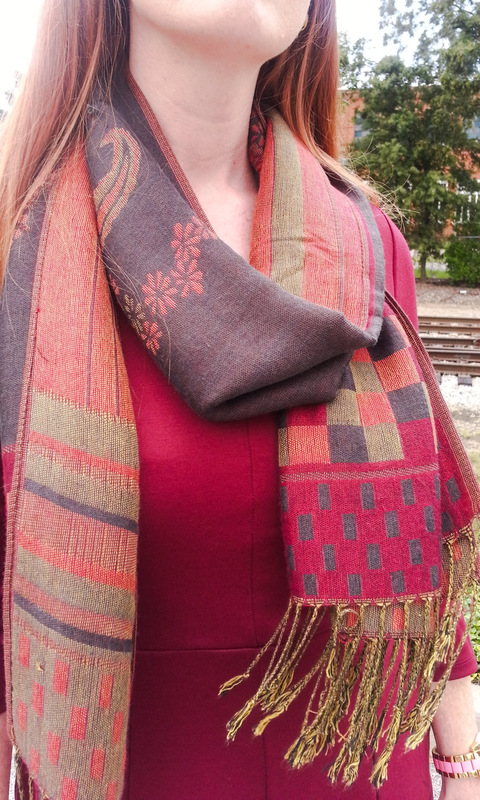 The fabric is fantastic and it hangs just right. It’s also affordable – on sale now for $48.90!! There are also other deals as part of Chic Wish’s Shop and Save event. 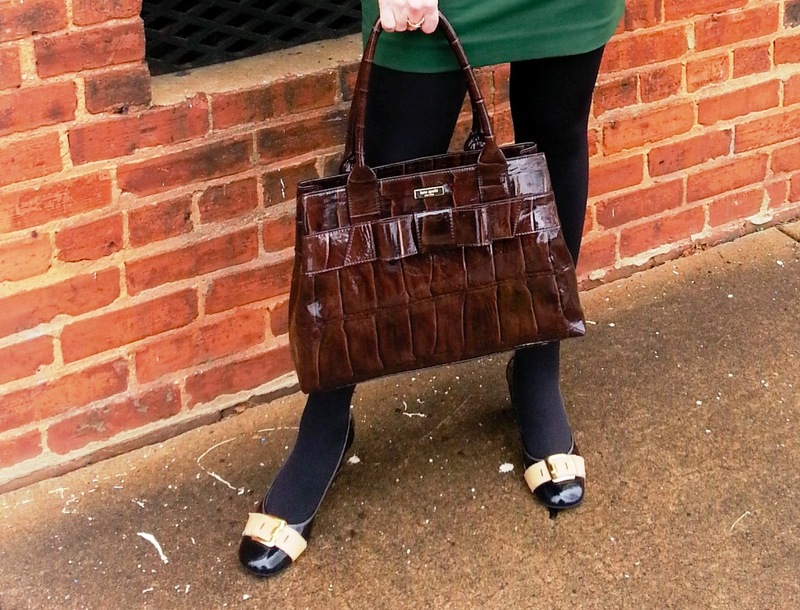 Bag – Kate Spade (of course! 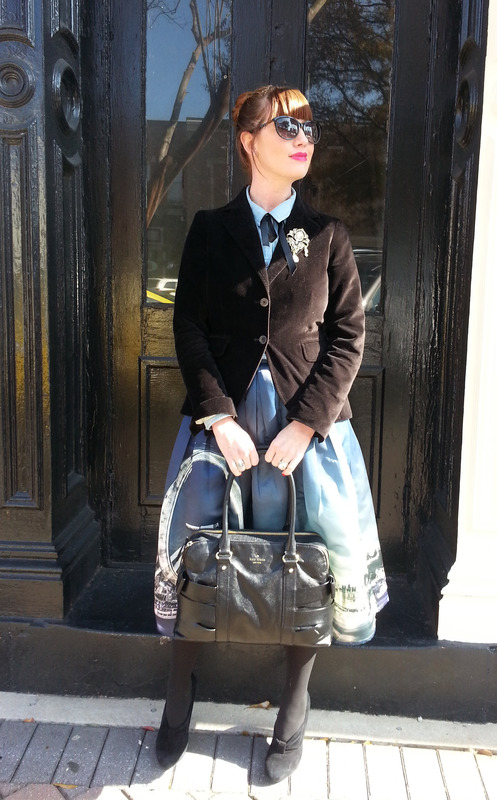 )…this is the Iconoclast bag and its sold out but here is one I really like also! Shirts I would buy if it were payday…. Happy Friday! As the title of this post implies, I’m broke as a joke and therefore window shopping. Or would that be “screen/monitor shopping”…regardless…I’m a’looking but I ain’t buying. I am, however, filling my ASOS online shopping cart with items I would buy if I could possibly do so and still make my car payment this month. Wanna see what I would get if I could get it!? 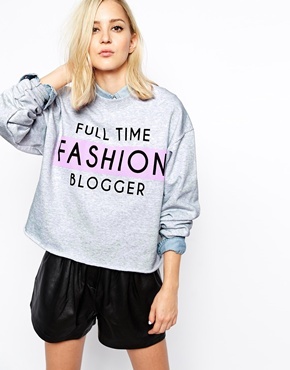 This, my friends, is THE Fashion Blogger Sweat Shirt. It is perfect in proportion and frankly..looks pretty comfy. 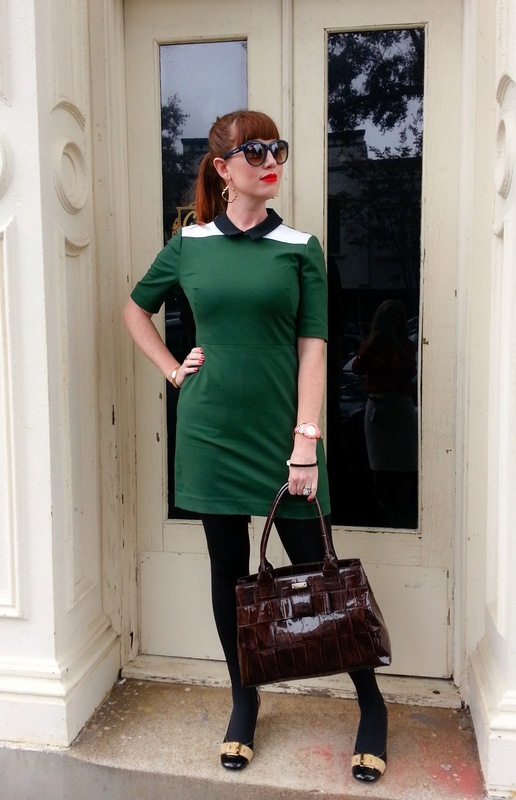 I totally think I could rock this with a brightly colored skirt….totally. Obviously this shirt is a MUST. In fact, I’d really expect ASOS to send this to me for free…it’s the least they could do considering my ASOS loyalty. 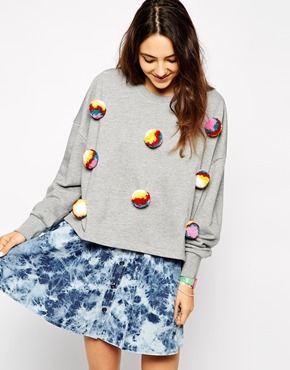 Next…the Pom Pom Shirt. It’s a shirt. It has pom poms. Buy. it. now. I guarantee everyone will compliment it but no one will replicate it. 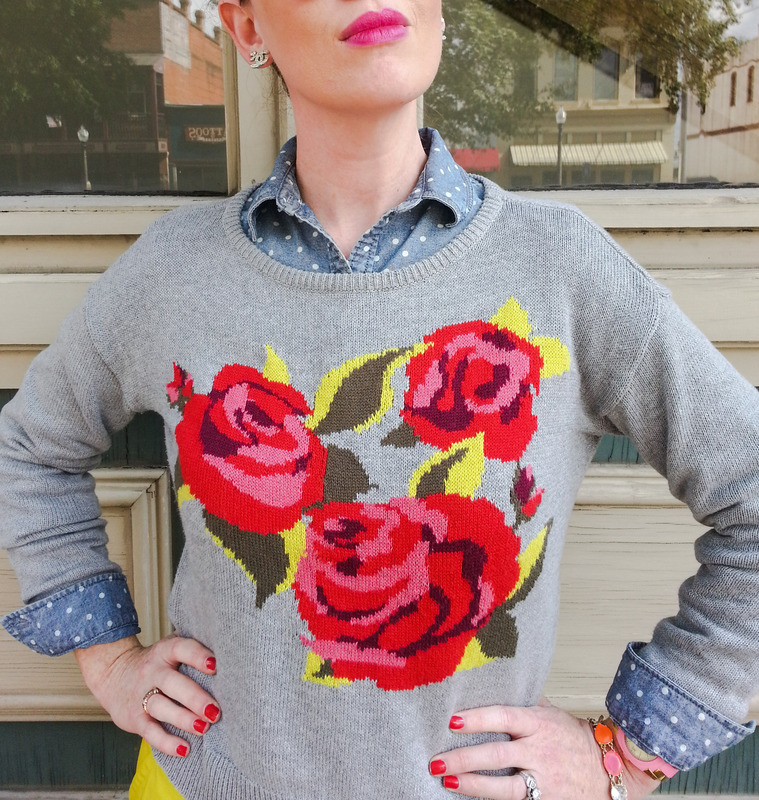 The Mohair Plaid Sweater …I love the colors and plaid is SO in right now. Beautiful, right? 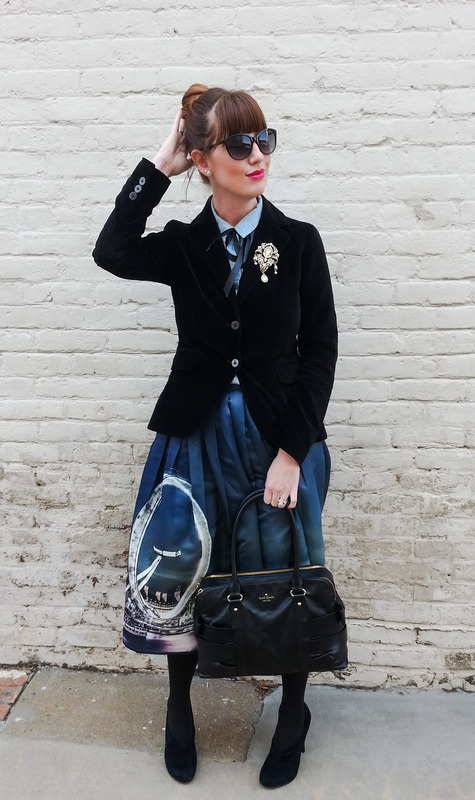 If you were to buy the shirt and the skirt…it would be perfectly understandable. Want work wear that is actually interesting? Try this Lace Sleeved Shirt. Very feminine but totally functional. The look of layers without the bulk. Beautiful. 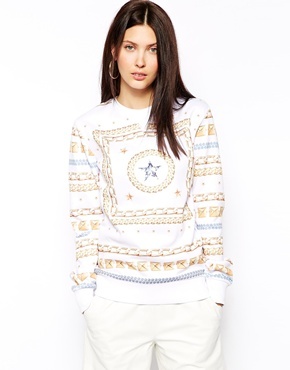 This shirt is aptly named: Criminal Damage Sweatshirt. I want it. Really want it. All I can think is Versace. Versace for me. If its criminal to want this shirt, I don’t wanna be right. And finally the Piece de Resistance..the Burn Out Florals Blouse. Why do I love this so much you may ask? Ever see the movie, Curse of the Golden Flower? (If not..get to Google-ing and check the images…the yellow embroidered chrysanthemum flowers are reason enough to see the movie). This shirt is the pink embodiment of that movie. Its wearable art and it is beautiful. I’d love to wear this over a fitted white button up and greet everyone with a nin hao! Get out your credit cards my friends and get to shopping! All of these lovely pieces are an additional 25% off at us.ASOS.com! 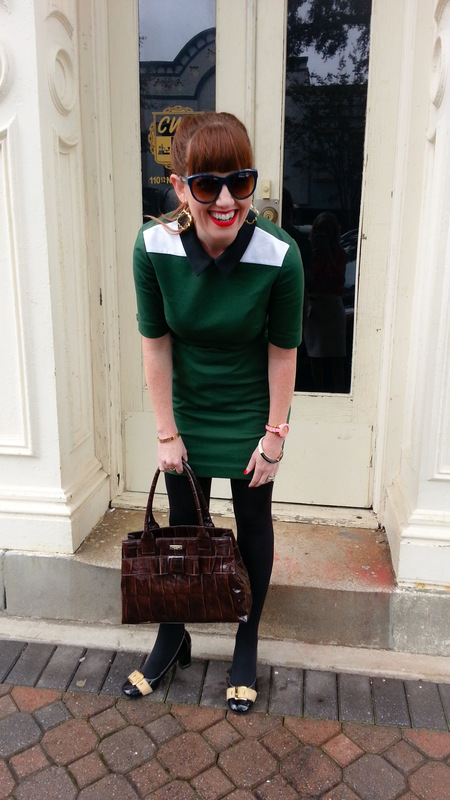 Necklaces: JCREW Sunnies: Franco Sarto PS. 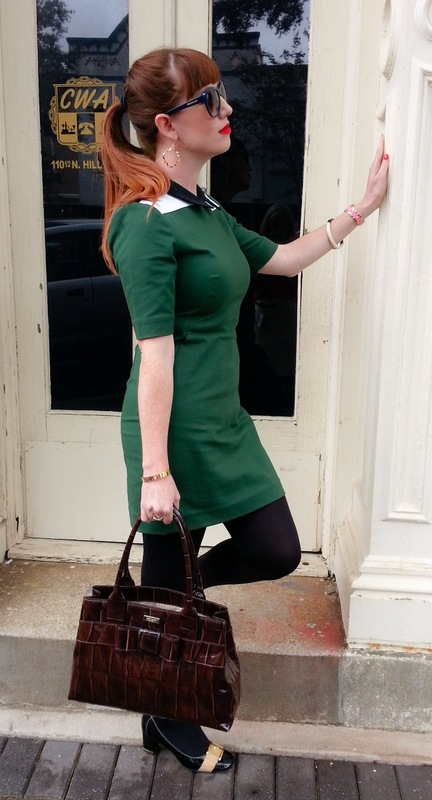 …I’m terribly sorry that my skirt is SO wrinkled in this picture..I took these after lunch and it couldn’t be helped! As I’ve been turning my wardrobe and shifting from summer to fall, I’ve discovered the beauty of “shopping” in my closet. During the turning, which sounds downright vampiric, I noticed several articles of clothing with tags dangling from their pretty collars and sleeves. As I inspected these items I realized most of the pieces were bought on clearance or at heavily discounted rates and were for more formal occasions. 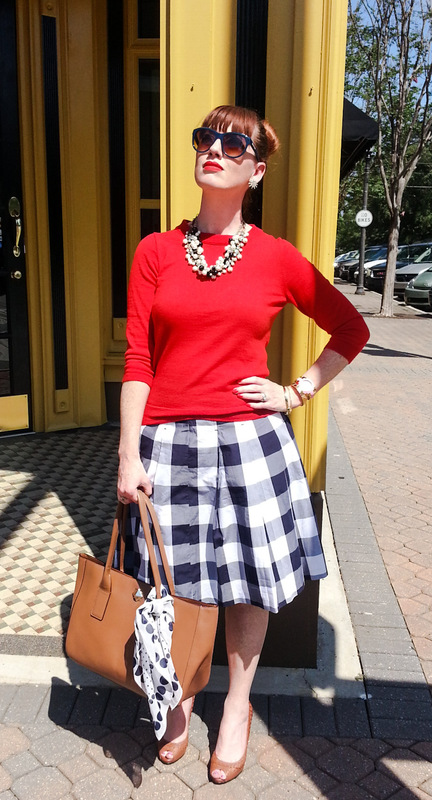 A fabulous blue gingham skirt that just needed a little special attention…. And so I decided to shop in my closet! Each of these items was bought because I truly loved some aspect of the design, texture or color and I found that I still loved these things…I just had nowhere to wear them! 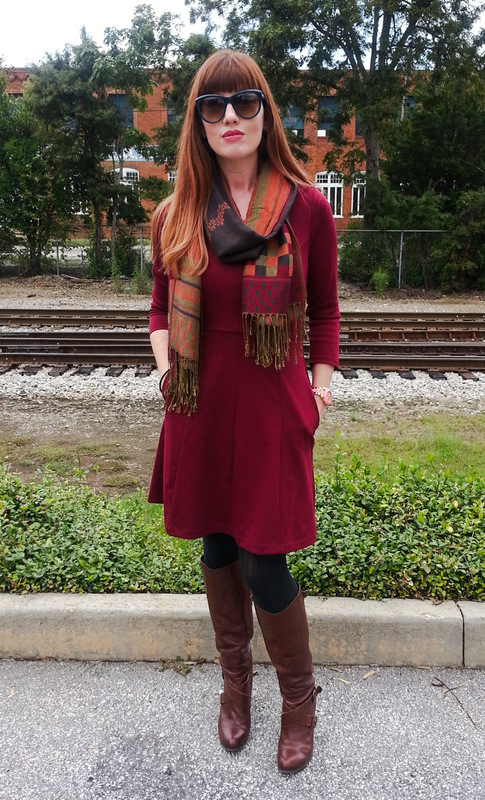 – Its Fall in the South and so sweaters and cardigans are great at dressing down an otherwise too formal skirt or dress. 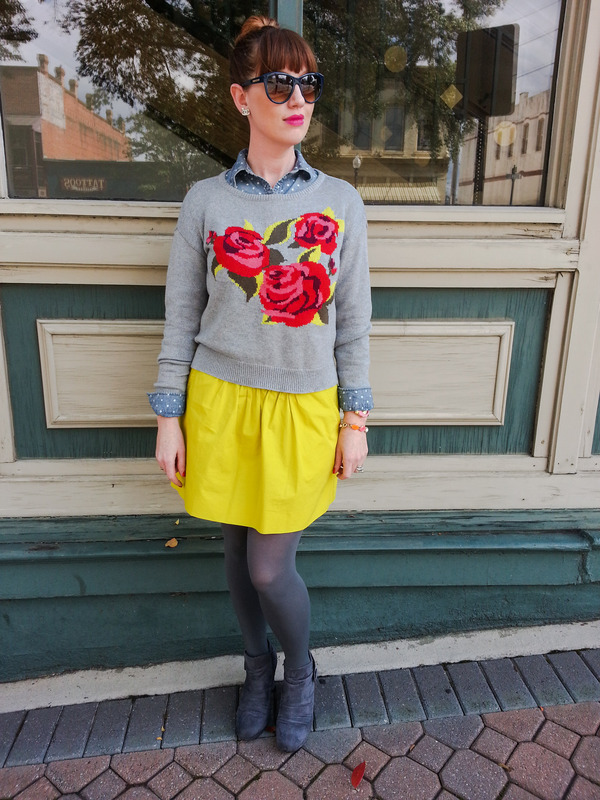 – Remember – you can always pull a sweater or cardigan over a dress to essentially convert it to skirt. If the dress still looks too formal underneath a cardigan, try layering a camisole under the cardigan but over the dress to conceal the top half of the pattern or button the cardigan fully. – Sheer hose will make your look too formal. 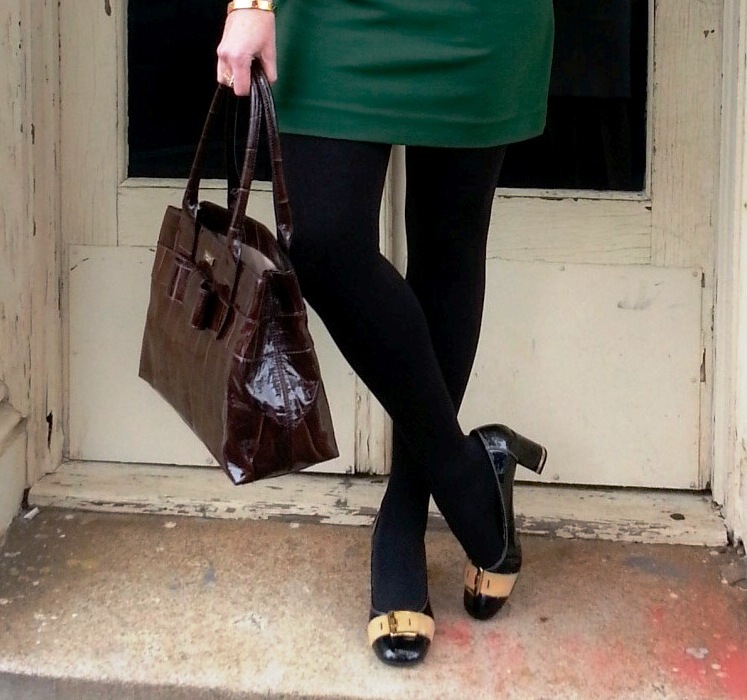 – Tights will instantly convert an otherwise formal skirt or dress to a less formal look. – Stick with low heeled boots or wedges – higher heeled styles will confuse the look as a higher heel is typically worn during a more formal occasion. – Be leery of boots with lots of hardware – it depends on the hardware but the boot needs to make sense with the overall look you’re trying to achieve. 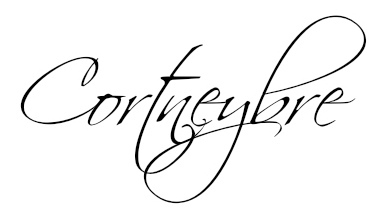 – Jewelry is a must but keep the jewelry simple or to one or two pieces. Opt for simple pieces that are bigger vs ornate smaller pieces. 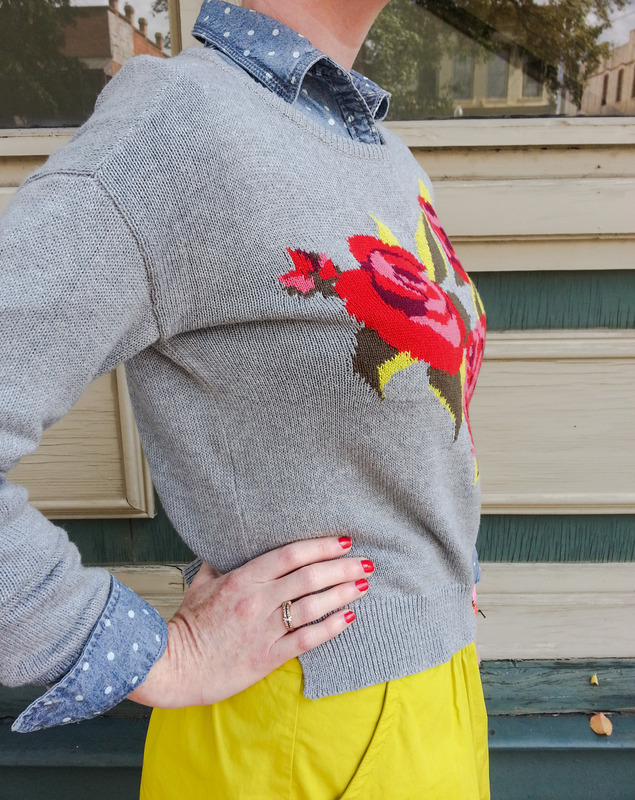 – Either nice slacks or jeans – skip the “hiney” embellishments! – Ensure the fit of the jacket compliments the shirt – The jacket needs to accentuate the blouse, not swallow or hide it. I hope these tips are helpful! Next time you’re staring aimlessly at your wardrobe, take a look at those items with the tags still dangling and enjoy shopping in your closet!